Great pictures. Neat cab. Most appropriate for the cold snap this week. It's funny people cut wood in the winter. I learned long ago to do the woodcutting in the spring when it's warm but not too hot. Then the wood is seasoned by the time you need it. These guys may be selling it, too. In that case forget the above. When there are no weeds to cultivate, the ground is frozen, the cows have been milked, fed and the barn cleaned, the grainery is full, the corn crib is full..... that's a good time to saw wood. In the late fall is when wood will start to be used. Anyway hauling wood in the spring when the thaw is starting it is hard to avoid mud, getting the wagon stuck, etc. You gotta hussle and wear gloves when sawing wood, a cool day is when sawing wood is most comfortable. I don't remember ever sawing wood on a warm day. 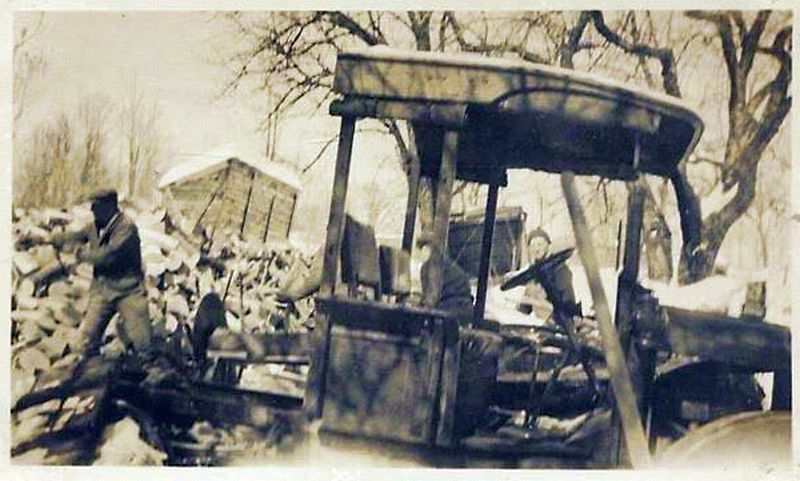 In the spring we were getting ready to plant crops, get the machinery ready and fences fixed. Anyway, we soon would not need wood. hauling the hay wagon loaded with wood up to the house to dump wood into the basement would be the time to really tear up the lawn. Best wait until the ground is frozen. Dragging logs out of the woods is easy when there is a little snow on the frozen ground. Fresh cut wood can burn all night but wood that was cut one winter, left laying until spring, cut up and then left wherever until the next winter was like burning paper. 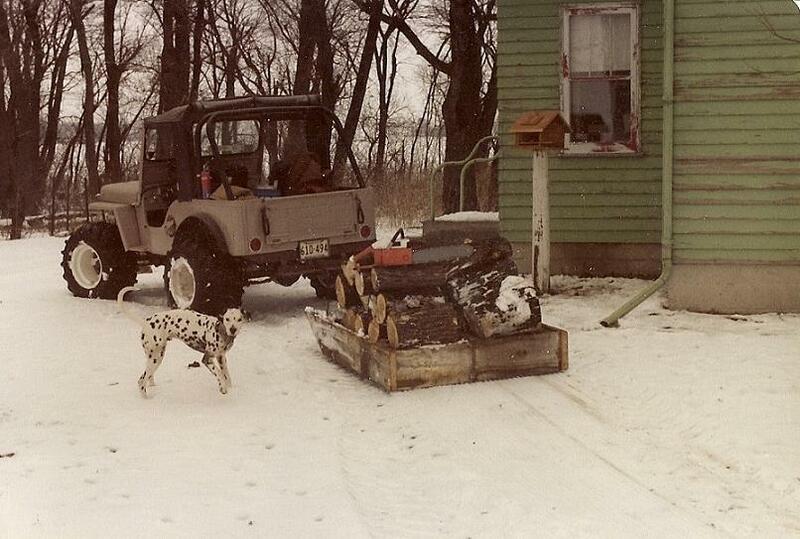 The farm I grew up on had about 60 acres of woods. We burned only wood during the WW2 years and it was in Wisconsin where it ALWAYS got down to -30 every year and some years -40 and there could be weeks when it never got up to zero the whole week, day or night. 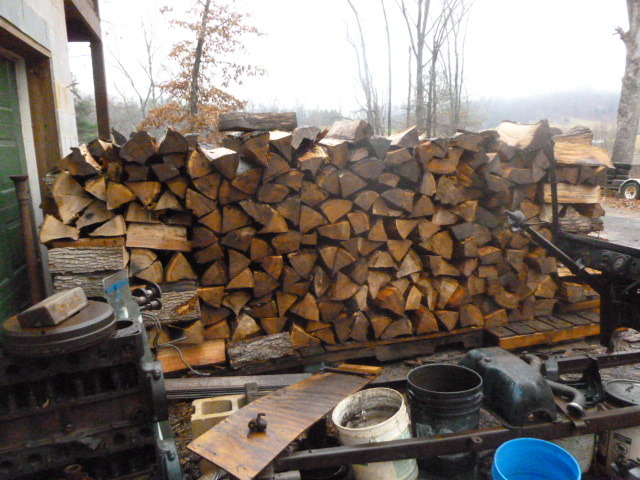 We cut firewood in the fall after the crops were harvested. The other farmers around us did the same. After the war we burned coal at night and wood in the daytime and evening when we were up and could mind the furnace without getting up during the night or wee hours to add wood. My background is more of a stump-rancher in the 'burbs and we used wood because we were too cheap to buy oil. So I suppose what you said makes more sense to most people than what I said! Brrr...too cold to be outside fiddling with some old car. Aaron is right! Dirt don't burn and it's hard on saw's!! Bud. Wisconsin hasn't changed. It's 1 degree out there right now headed to a low in the -20's tonight. And yes, my wood furnace is cranking away. I don't think of adding wood "in the wee hours". Thanks to advancing years and a shrinking bladder, I think of adding wood in the 'pee hours' a couple of times a night. Nothing like the comfort of solid fuel heat though. Here's a owb I built a couple years ago,got her burning as I type,shoulda built it a long time ago! That damn saw in the first pic scares the hell out of me just looking at it. 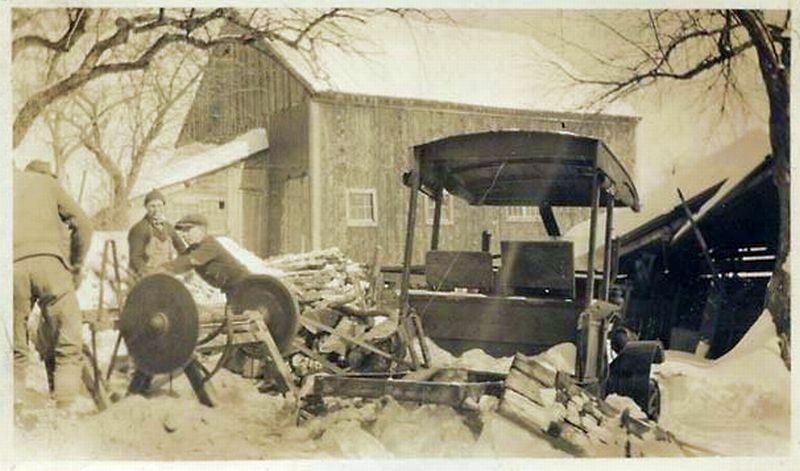 You can almost bet that saw is staked down with Model T axels!! Bud. Yep, that saw in the first pic is an OSHA nightmare. At home we used a 'Mobilco' swing saw. Using that the log was chocked on the ground and the saw (on wheels with a long arm and a circular blade at the end) was manouvered into place and lowered onto the log to cut the foot blocks from the log. At one time we had a bench that mounted onto the blade end of the Mobilco as well for lighter wood. 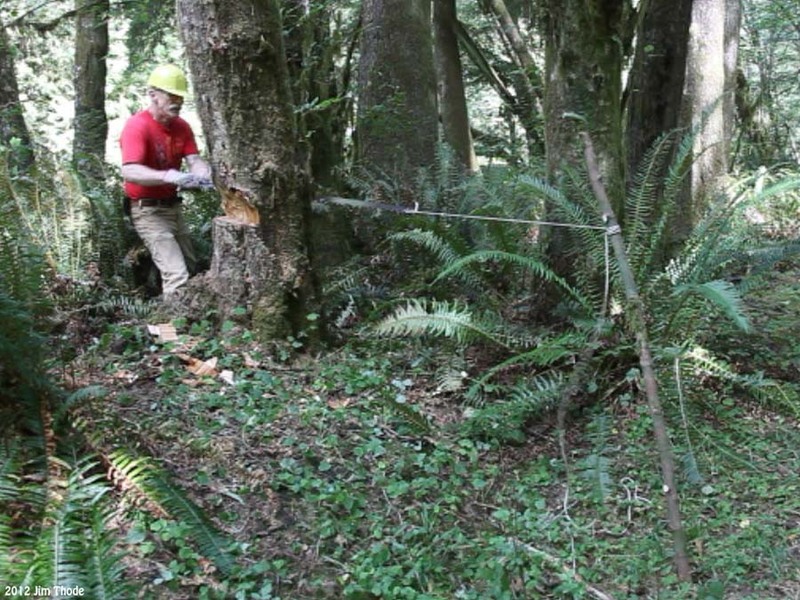 Nowadays I use a chainsaw, but chain saws of the 1950's were rather heavy devices. I expect that most in the USA have access to conifer sourced soft woods. Here in Oz our main wood is eucalyptus (gum trees), and there are many varieties. They are all hard woods, some being extremely hard. While they can be burned 'green' they will, in that state, generate a lot of soot and less heat than if they are dry. I generally cut my wood when it is green as it is easier to saw, but then I store it under cover for a minimum of two years for it to dry. Generally at the start of Winter I have 3 years supply on hand, one lot for this winter, one lot for next and a third for three winters hence. The dry wood produces good heat and little soot. We don't have extreme cold in Southern Victoria, only occasional frosts and day-time temperatures up around 45 or 50 degrees F.
The wood-fired heater for our main room, if loaded with good dry wood at 9.00 p.m. still have plenty of glowing coals at 6.00 a.m., ready for a re-load. 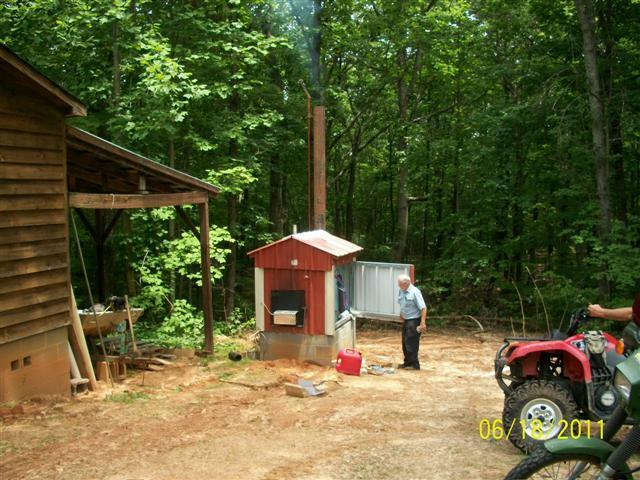 We also use a wood-fired stove for cooking and hot water supply. I usually light that at about 4.00 p.m. so it is good and hot to cook the evening meal. After the cooking, I load it up with fuel, shut down the air supply and let it burn very slowly through the night until it goes out, that provides more hot water than my wife and I can possibly use. I find it very interesting to compare our different heating methods with USA, but of course the temperature and the type of wood available would explain some of the differences. 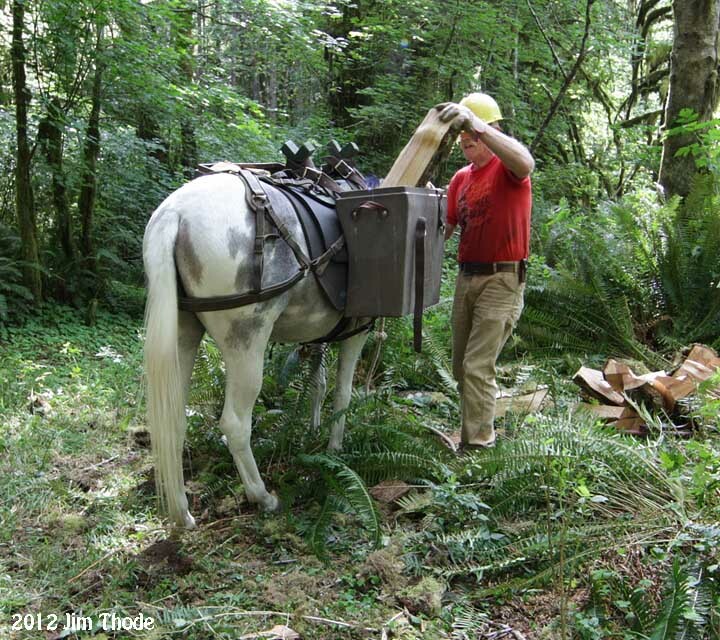 For years I used a 30" saw like the one pictured, driven by a one-cylinder steam plant of about two horsepower. I would pull the engine on its heavy wheeled cart to near the pile of three limbs I saved from when the neighbor pruned their cherry trees in their 40 acre orchard each year. The pile of limbs would be about 20' across and 8 or 10 feet high. Then drag the saw in its skid feet to the engine and align it and belt it to the engine with a flat belt about 5" wide. Drag a water hose to the engine and connect it to the injector. Snap off twigs and branches from the limbs and get a fire burning under the boiler. Park the C-cab TT stake bed next to the saw and pull out the rear stake panel. Tend the fire and stuff the firebox, enjoying the great smell of burning cherry. As steam comes up it is time to oil the engine. The crank, rod and cross head are exposed and need regular attention. Once steam starts to show and the engine will roll over slowly, the exhaust up the stack will increase the draft through the boiler tubes and draw oxygen through the grate below, greatly increasing the intensity of the fire. As the steam builds, faster now with the draft, the wood consumption increase exponentially and it demands much more attention. The first limbs dragged from the pile must be small because the outfit is still "cold" and feeble, but these first limbs will go right into the fire box, helping create a great, thick bank of glowing coals. Things improve quickly at this point. The steam is hotter and drier and more lively. The engine's cylinder is only 4" x 5", but it is enough to make that 30" saw whistle. After it has run for half an hour, it is humming like a little locomotive pulling a grade. It is music. The limbs are dispatched, in turn, through the saw in stove lengths, the perfect piece is about the size of a loaf of bread. After each is liberated from the limb it came from, it is tossed right into the back of the truck parked two feet away. Odd shapes, "Y" shapes and limb crotches, are tossed in front of the firebox and are consumed to make steam. It was a fun, exhausting activity and I always looked forward to it, until the drunk doing over 60 mph bashed into the TT, T-boning me at the front of the running board, right at my feet. The truck rolled and was totaled, I was a wreck and the load of wood I carried only a couple of days before was the last one I ever carried. The engine and saw sit, waiting. Some great stories , brings back memories as a boy working in my dad's sawmill. Always treated those big saws with great respect.We also cut our firewood the previous winter to season and dry all summer. 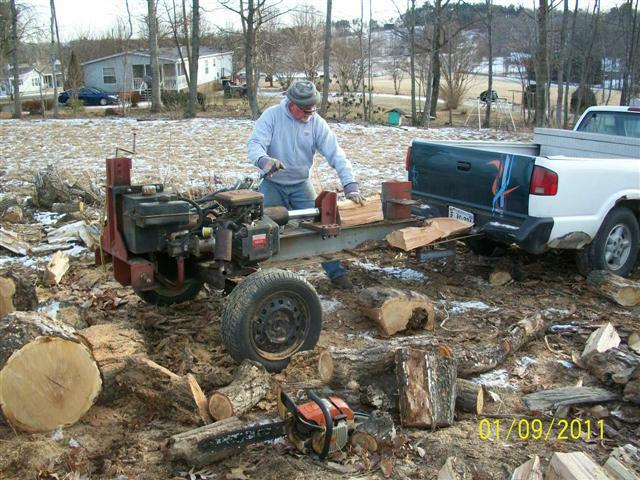 In the old days we used a saw as pictured and the neighbors had a new sears both staked down with Model T axels and belted to our F-20's.Emil Nowack had a loader and he would make large piles of 30-35' white ash then he would mount his saw on the front of his H.With a dumb kid named bud throwing away,Emil working the table,and about 4 carying the poles we cut alot of wood in a hurry!!!! Later i built a saw for the back of our 200 with fast hitch.I had a 30" saw but always wanted a 36" to eleminate rolling/turning to get all the way through. Now we burn a corn wood pellet mix and i don't need any saw!!! Bud. I used to burn wood on the farm place I rented. This was my way of hauling wood out of the woods. I had three Jeeps and my dog was named Jeep. Before my time my Dad got cut by one of those big open buzz saws. It went in at that bone/bump on the out side of the wrist and sawed toward his elbow. 50 stitches, but it all healed well and he could use all of his fingers as though it never happened. Usually the first sign of someone getting cut was blood in the snow. They would stop and everyone had to check their hands and arms because getting cut while working & lifting on a cold day you wouldn't always feel getting cut. In my younger days it was quite common to see guys with fingers missing. While there may be lots of reasons for cutting wood in the winter as per the remembrances above...I haven't seen the real reason yet! Quartering the wood! I wonder when Steve is getting a horse for hisself ? I did this in 2 days by myself. One day with an ax and a hammer and wedge and one day with a wood splitter. Figures to be about 5 cords. Enough to last all winter I think. I will go back and get 0ne more load on my coal burner of about 2 1/2 cords to be sure. Man, I'd never cut wood in a T-Shirt. 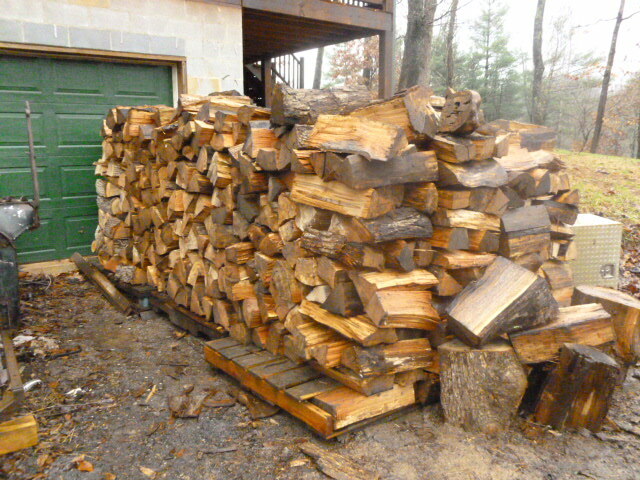 Wood is supposed to be cut in the winter - for the next winters heat if it's oak or other such slow drying wood. I've had a wood stove going all winter since 1965 and I've never cut in hot weather. Tomorrow, I'll go to my woods and cut a trailer load of dead elm or ash. As you probably know, all the ash trees are dying. 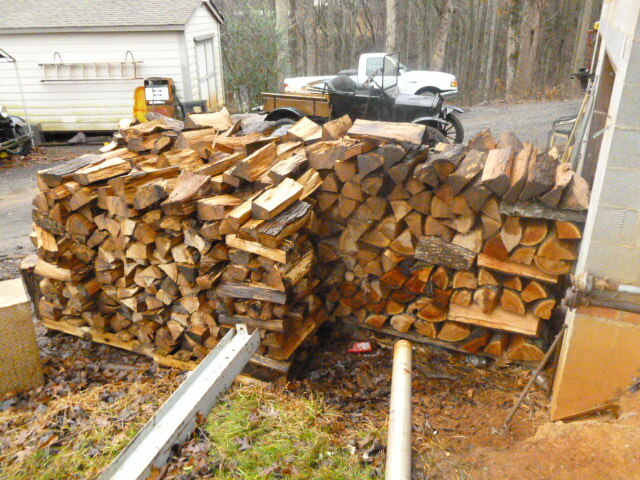 There will be plenty of wood for the next few years. Tomorrow is supposed to be 23F and sunny. There won't be any wind in the woods, so the weather will be perfect. 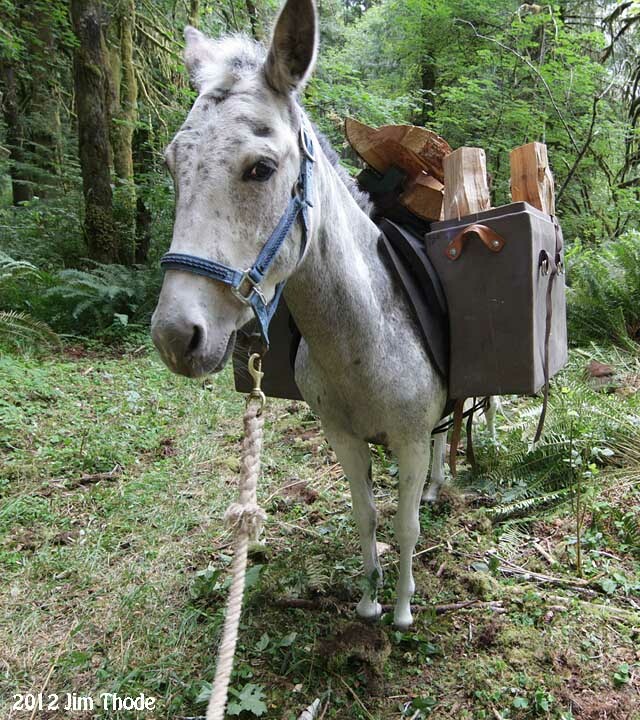 Oh yeah, one more thing actually three, it wouldn't be practical for me to haul wood on a mule's back. It would take two or three loads a day. Also, a cord of wood is 4x8x4. A rick as commonly used can be any length of wood, which means a rick can be almost anything. Another thing I forgot, the reason to cut in the winter is the the sap is down. 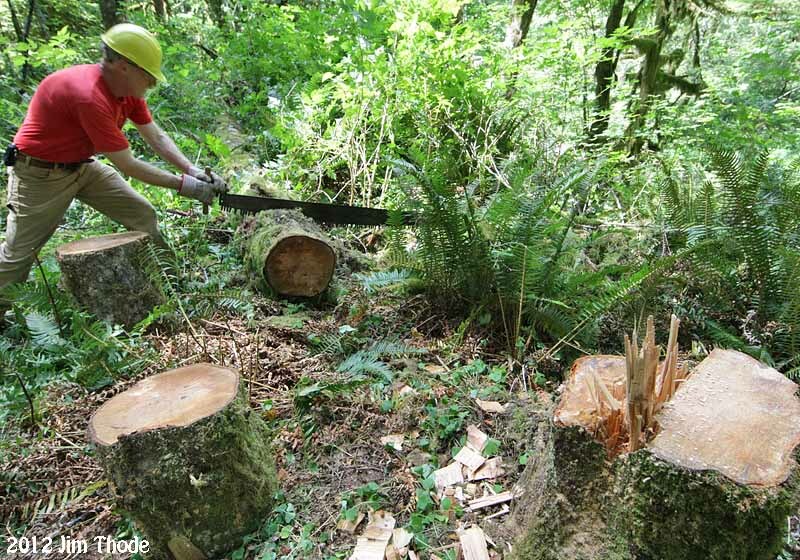 Many types of wood can be cut and burned directly - in the winter. Ash, thorn, hickory come to mind. Oak has to sit for at least a year after being cut.